We reviewed Cableguys impressive Curve 2 synth a couple of years ago, and were very impressed with the huge feature set and great sound of the synth. Their unusual cloud style preset design has created a great user community, and attracted some great synthesists and artists who contribute in various ways. So it goes without saying that we were excited to receive the latest plugin from the guys in Germany. 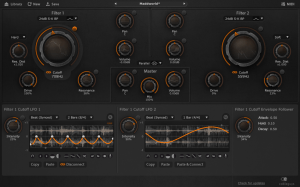 Filtershaper3 is the next installment of Cableguys effects plugin. No prizes for guessing the main reason for Filtershaper’s existence. However, with a bit of diving about, it seems Filtershaper3 has more under the hood than just plain old filters. Slotting right in to the current product line, the refined color palette of orange, grey and black is the new look for Filtershaper 3. The GUI is dominated by the cutoff knobs for the two filters. A click on the Menu list above the knobs gives you a massive choice of filter types, from clean non-resonant 6DB through to a new addition of the classic Sallen-Key emulation filters. Each filter has a resonance, drive and resonance distortion, adding nice grit and grime to the filtered sound. There’s a mix knob which allows the user to choose how much of each filter to have. You can choose to have the filters run serially or in parallel to each other. The filters sound good. They hold their own against other digital filters available. But they’re not really the selling point of the plugin, to me. 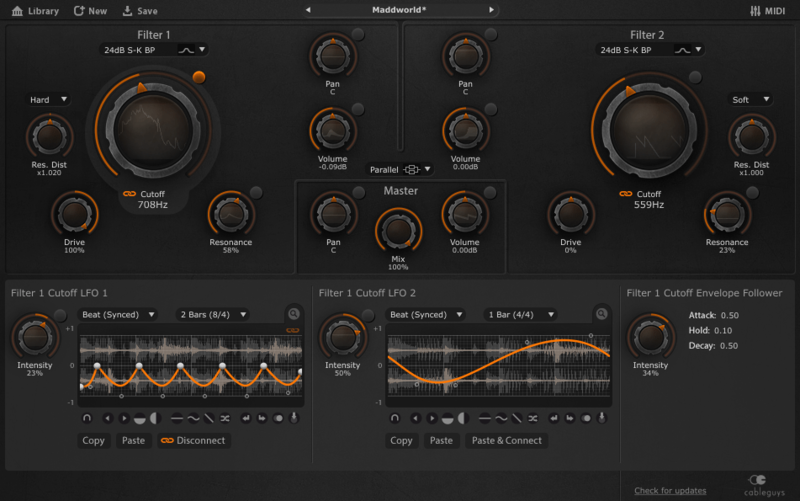 Filtershaper3 really stands on its own with the modulation section at the bottom of the plugin GUI. Most of the main controls of the filtershaper plugin are modifiable by two LFO’s, and a very simple envelope follower for each parameter. 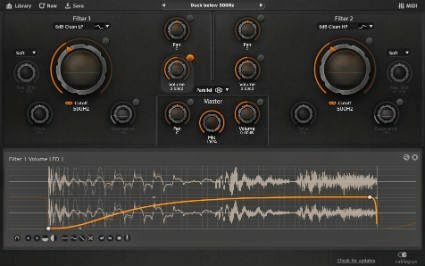 Clicking on a small button to the top right of the appropriate knob will open up two windows displaying any current or recent audio played, overlaid with bright orange LFO waveshapes. LFO wave shapes can be chosen from the basic starting points (sine, triangle etc), and edited from there, adding soft curves and hard angles with various mouse clicks. The LFO’s can be tempo synced to host, or free, and you can choose how intensely the oscillator affects the control it is pointed at. The synced tempo speed goes up to 1/128 – enabling some pretty crazy gritty sounds! Creating your own waveshapes gives you the opportunity to use Filtershaper as an effect to create subtle movement within the sound, or as heavy duty mix controls – such as creating a pumping side chain effect for example. Interestingly, the modulators can themselves be modulated – the intensity control, or the depth of the LFO can be modified in the same way – giving another level of modulation. As with all Cableguys plugins, the user community directly affects your preset library. Thousands of presets present themselves once you link up with the Cableguys cloud system. There are several ways to search for plugins; by name, type, star rating, etc. The presets you create can be saved and kept private to your computer, or shared with the community when you next sync up with the cloud database. There are definite pros and cons to this – you are opening up your system to gather presets from anyone and everyone. The benefits of this is that you literally download thousands of presets created by whoever decided to upload their creations to the web. While I’m not by any means a preset snob – I wonder if perhaps the filtering system of the presets could be a little more deft – allowing for different levels of experience, or more obvious ‘Cableguys Official’ preset creators. I don’t want to bash it too much, however, as it is a very adventurous step in preset library curation. I think the potential here is a lot greater than the closed off in-box system of most other plugins. Filtershaper3 is a really fun plugin. I love the obvious thought put into the ergonomics of the plugin, and I think they’ve come up trumps with the balance of intuitive utility to potential sonic mayhem. While the filters don’t necessarily stand out as world beaters, they still sound great, and the real weapon of the plugin is it’s modulation capabilities. I guess Filtershaper sounds better than Elefohper.